You know young Lucie has had a hard time of it when a Catholic orphanage feels like a sanctuary. You can also guess her original film is some tough stuff when fans wonder if a company like Blumhouse can handle remaking it. Pascal Laugier’s 2008 cult favorite isn’t considered a leading example of the New French Extremity movement for nothing. 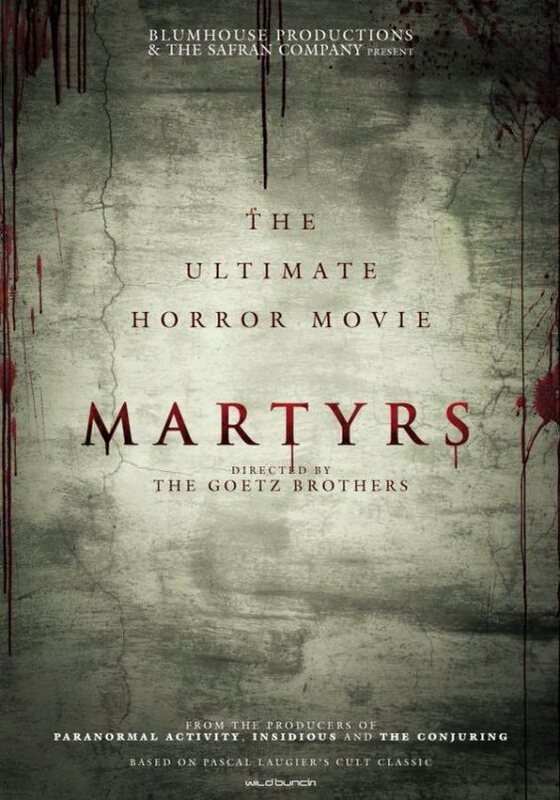 Some of the roughest, most jagged edges have been sanded down a tad, but the faint of heart, stomach, or aesthetic sensibilities should be duly warned when the Goetz Brothers’ Martyrs (trailer here) opens tomorrow in select theaters. Believing she has tracked down one of the men responsible for her ordeal, Lucie arranges to meet Anna at his secluded home for a confrontation. However, Lucie executes Dr. Patterson and his family before she arrives. Finding her friend in a state of psychotic delirium, Anna assumes the worst. Yet, just as she is about to call the law, she stumbles across profoundly disturbing proof that more than vindicates Lucie. From there, things get extremely dark very quickly. Laugier’s Martyrs is not quite as soul-deadening Srdjan Spasojevic’s beyond-the-pale debut, but it is definitely on the extreme side of the spectrum. They might be controversial with fans, but screenwriter Mark L. Smith’s moderating alterations will make it go down easier for ninety-nine percent of horror fans. As the title indicates, both films use Christian concepts in rather problematic, fast-and-loose ways, but for faith-based audiences that should be the least of their worries. Still, for seasoned horror fans who do not carry baggage from Laugier’s original, it is a pretty slick, undeniably dark package. Troian Bellisario and Bailey Noble are quite convincing as Lucie and Anna in their various states of insanity and duress. The same is true of Ever Prishkulnik and Elyse Cole as their younger selves. However, Kate Burton (Richard Burton’s daughter) really throws down the gauntlet, so to speak, as the sinister leader of the shadowy cult. Frankly, sensitive readers should have checked out long ago. By genre standards, it is quite well designed and assembled, particularly the Patterson home and everything attached to it. The Goetz Brothers’ version is probably doomed to failure, since the core audience will have such strong opinions on Laugier’s film, but it is better than you are likely to hear. It is hard to precisely identify the audience to recommend it for, but presumably you know who you are, so be advised it opens tomorrow (1/22) in targeted theaters and on iTunes.